SOLE WEIGHTED CAVITY BACK IRONS: INCLUDES PUTTER!! AVAILABLE IN GIRLS LEFT or RIGHT HAND, TEEN or TWEEN LENGTH!! Your buy it now price is MUCH BETTER!! YES, this set was "INSPIRED" by the popular CALLAWAY X-12 PRO SERIES SETS (and the best part is the AFFORDABLE price)!! 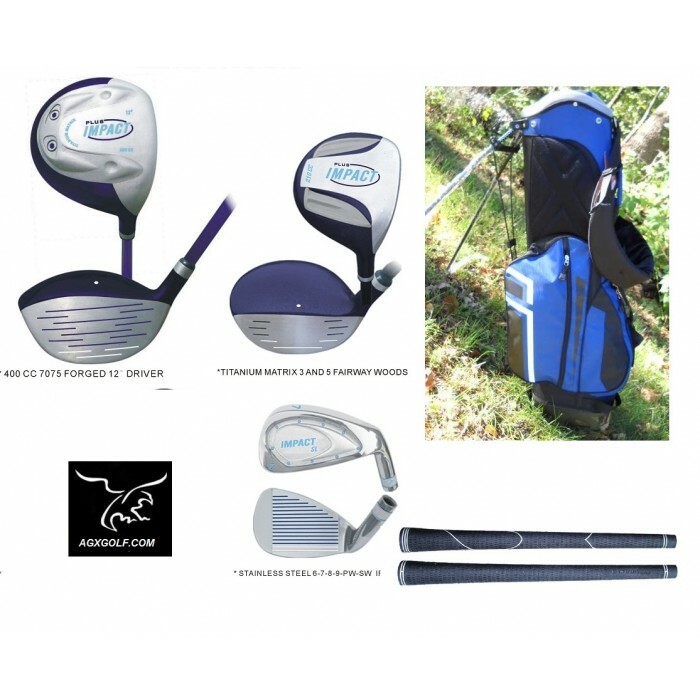 This STARTER set of golf clubs from AGXGOLF is a full technology package!! FAIRWAY: 5 Wood (19 degree): Large Profile "Over size face. The WELL CRAFTED IMPACT IRONS are real "shot makers"! The OVERSIZE DURABLE heads with the WEIGHTED SOLES keep the CENTER OF GRAVITY LOW and that make it MUCH EASIER to and get the ball AIRBORNE FAST! And the OVERSIZED Cavity Back, Perimeter weighted club head design make it much easier to hit a STRAIGHT SHOT! We can not over emphasize the value of the Sole Weighting: The advantage is that the lower center of gravity produces soaring Tour-Style golf shots. It's so much easier to get a nice high loft on your shots and that means greater accuracy and "Pin Point" SOFT LANDINGS! This club head design technology, plus the superior High Modulus Graphite Shaft Technology produces a golf club with outstanding distance with a great feel that is easy to swing. The important thing to keep in mind is that the IMPACT GIRL'S EDITION set is engineered for Young Golfers who are learning the game but are to big for a "Junior" set. It makes it easier for them to learn to hit good shots. It also allows them to start getting the feel of an adult set. This means that your Young Golfer will have more fun and FEEL MUCH BETTER about herself!! You may not get this benefit from older "hand me down" Adult sets. Handsomely designed with superb technology, this is a set your young lady will be proud to have!! These clubs are easy to learn with! It really is a smart choice, whether it's a first set or you are upgrading from a mix and match set to the newest technology in golf equipment. DRIVER: 400cc Over sized TITANIUM MATRIX ROUND HEAD for MAXIMUM DISTANCE and larger "SWEET SPOT"
BONUS FREE PUTTER: These are an excellent design; the Flange style head features a precision face with "Heel-Toe" weighting to help keep the Putter head on line for more accurate Putts. 100% HIGH MODULUS PREMIUM (Dark Blue) LITE FLEX GRAPHITE SHAFTS on all clubs (except Putter). GIRL'S TWEEN: For HEIGHTS of 4'8" to 5'3"
GIRL'S TEEN: For HEIGHTS of 5'3" to 5'7"
Stated Shipping charge for contiguous U.S. only. Other destinations will be billed at our actual shipping cost.